I hope you're all enjoying your long Thanksgiving weekend! I'm sorry that I haven't posted that many projects for the last couple of weeks. Things have been a little busy around here since I returned from On Stage. Things should be getting back to normal, now, thank goodness! Here's a Short & Sweet Saturday card for you. I wanted to use some of the products in the Snowflake Showcase. These items are only available for ONE MORE WEEK! Wow, this month has flown by. 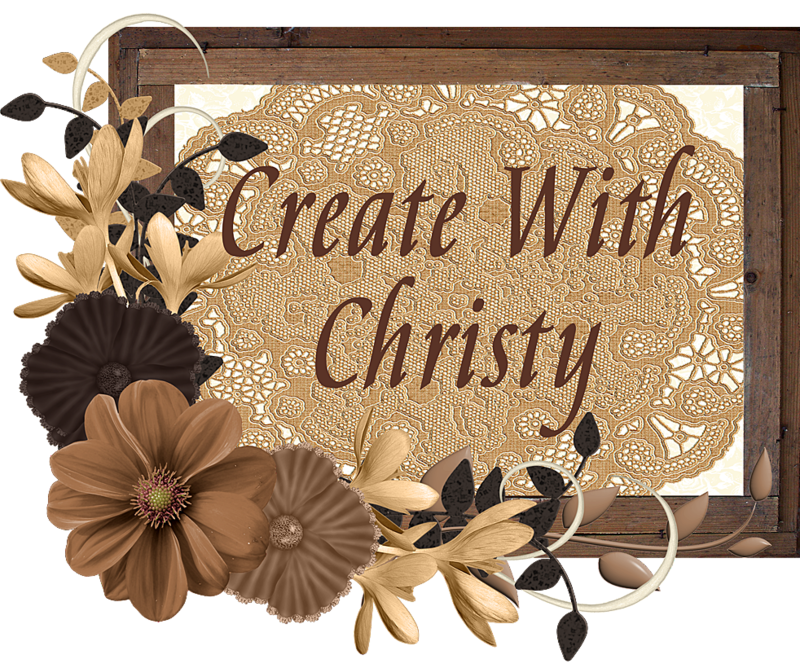 I LOVE all of the products in this showcase, and want to make as many projects using them as possible! By the way, one of the Snowflake Showcase products has sold out...The White Velvet Paper is gone! The other products are while supplies last, too, so they may not make it until next Friday. To be on the safe side, you better get them ordered now! 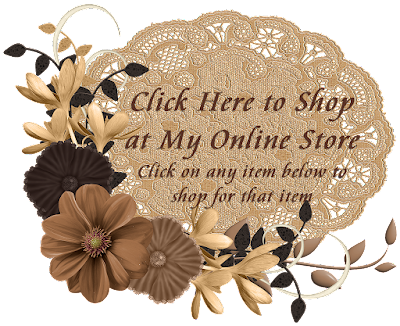 You can see all of the Snowflake Showcase products by CLICKING HERE. Emboss the largest Whisper White piece by running it through the Big Shot with the Swirls & Curls Textured Impressions Embossing Folder. Fold the Thick Whisper White piece in half to form the card base. I suggest scoring the piece at 4-1/4" (with an 8-1/2" side along the top) before folding. Attach the embossed layer to the center of the card front. 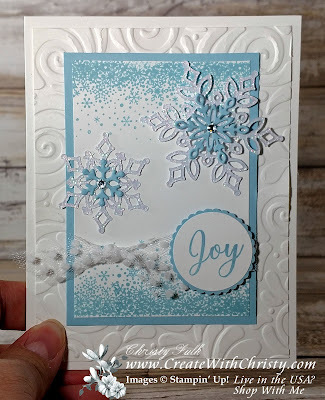 Stamp the snowflake border stamp from the Snow is Glistening Stamp Set across the top and bottom of the snow falling layer piece using the Balmy Blue Classic Stampin' Pad. 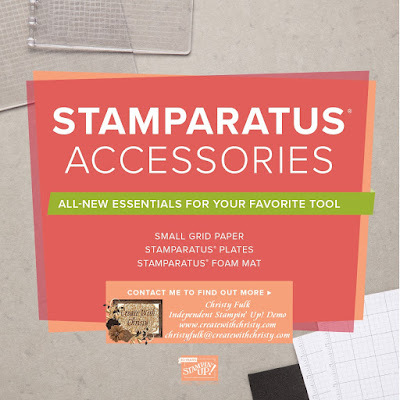 I suggest using the Stamparatus when stamping these borders. You can see how to do this by watching my Snowflake Showcase Facebook Live Video. Attach the stamped piece to the center of the Balmy Blue mat piece. Wrap the 5" ribbon piece across the bottom part of the piece, and attach the ribbon ends to the back of the Balmy Blue mat. Attach the whole thing to the center of the card. Stamp the "Joy" stamp onto a scrap piece of Whisper White cardstock using the Balmy Blue ink pad. Punch it out with the 1-1/4" Circle Punch. Punch out a scallop circle from a scrap piece of Balmy Blue cardstock using the 1-3/8" Scallop Circle Punch. Attach the "Joy" circle to the center of the scallop circle, and then attach it to the right side of the attached ribbon using Stampin' Dimensionals. Tie the 4" ribbon piece to the left side of the attach ribbon using a single knot. Trim the ribbon ends at an angle. Die-cut the second-largest and third-largest snowflake thinlits dies from the Snowfall Thinlits Dies out of the Sparkle Glimmer Paper piece. Die-cut the fourth-largest and the second-smallest snowflake thinlits dies from a scrap piece of Balmy Blue cardstock. 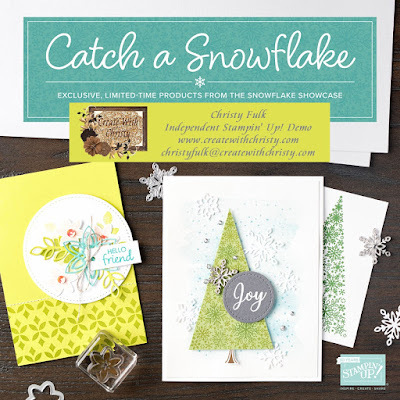 Put a Stampin' Dimensional onto the back, center of the largest glimmer snowflake. Attach the largest Balmy Blue snowflake onto the center of the large snowflake using a Mini Glue Dot. Attach the snowflake to the top, right of the card (see picture). Attach the last Balmy Blue snowflake to the center of the last glimmer snowflake using a Mini Glue Dot. Attach them to the left side of the card, just above the ribbon using a Mini Glue Dot. Attach a medium-sized rhinestone from the Rhinestone Basic Jewels to the center of both snowflakes. If you have trouble opening the tutorial, please make sure you have an updated pdf reader. 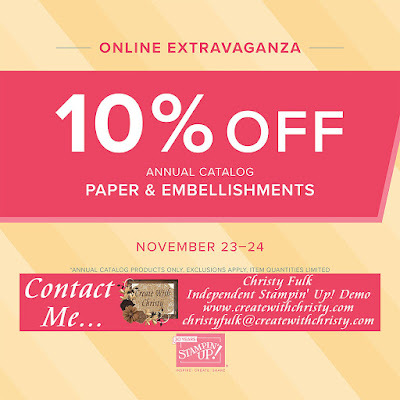 DON'T FORGET ABOUT ONLINE EXTRAVAGANZA! 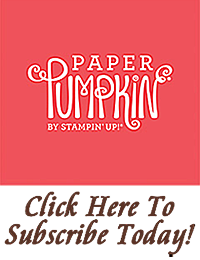 The first sale, Paper & Embellishments, will end tonight @ 11:50 p.m. (MT). 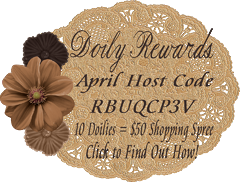 Also, don't forget about my Doily Rewards Program and this month's host code.